Alfa CEO and Chairman Marwan Hayek, received at the company's headquarters in Parallel Towers, Dekwaneh, Lebanon a delegation from Al-Riyadi Basketball Club headed by the President of the Club Mazen Tabbara with Secretary Tammam Jaroudi in addition to the technical staff and men's team players. Al-Riyadi offered the Alfa Cup to Hayek, as a tribute to Alfa for its continuous support for the team. Hayek congratulated Al-Riyadi champions saying "Our happiness has doubled with this win. The cup bears Alfa's name and was won by Al-Riyadi. We have been partners for a long time until we became one family." He hoped that Al-Riyadi would score future victories in the Alfa Lebanese Basketball Championship. 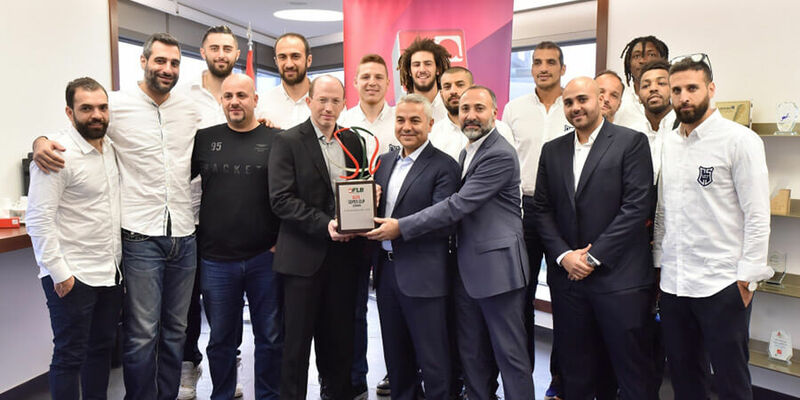 He expressed his gratefulness to the Union for its initiative "to give the name of Alfa to the Super Cup, considering the continuous cooperation between us, which will be crowned by an important announcement about the Alfa Lebanese Basketball Championship." In his turn, Tabbara thanked Hayek for "Alfa's support to Al-Riyadi, which grants us the opportunity to compete in foreign and international tournaments and not only at the local level, to promote Lebanon's name in the world and Alfa's name always accompanies us in all these tournaments and victories." Addressing Hayek, he added, "It's the first time we win a cup bearing the name of Alfa, and we are here offering you the Alfa Super Cup since Al-Riyadi is Alfa's team".